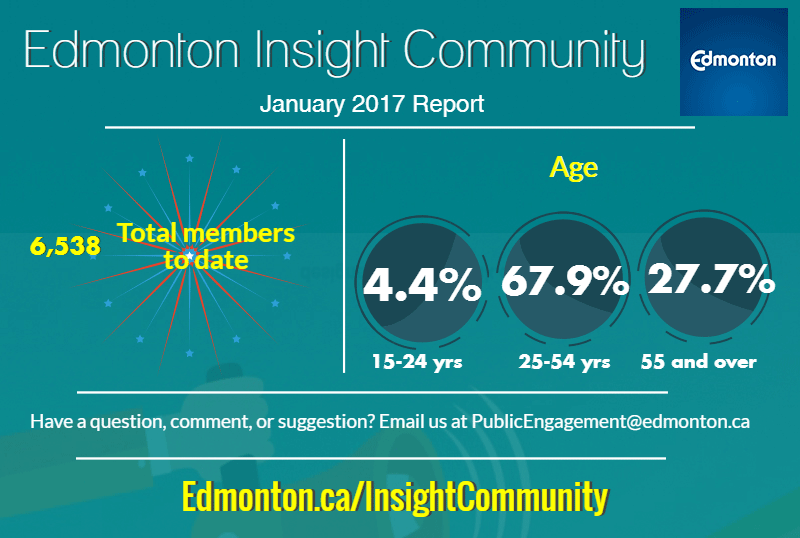 Insight Community included in Traffic Safety Culture Survey Report The 2016 Edmonton Traffic Safety Culture survey shows gaps between what we believe about traffic safety and our actions. In the public online survey, 94 per cent of respondents said drivers text messaging, emailing or using social media is a serious threat to their safety, yet 33 per cent said that over the past month they have done so while driving and 62 per cent while stopped at traffic light. “To reach the Vision Zero Edmonton goal of zero traffic fatalities and serious injuries, we need to ask ourselves if our own actions are putting ourselves and others at risk,” said Thue. Join us at one of our upcoming public information sessions to learn more about how the City of Edmonton is transforming the way we engage with citizens. February 23, 2017 from 5:30 to 8:30 p.m.
February 24, 2017 from 2:00 to 4:00 p.m.
February 25, 2017 from 1:00 to 4:00 p.m.